Messieurs Poloz, Flaherty, Carney, Bernanke and Madame Yellen et al are all on the record warning about leverage and the cost of it as a major risk going forward. Chris Kimble makes an interesting observation that the St Louis Fed Stress Chart is at the lowest historical levels just as it was in 2007 and 2000 when the S&P 500 was at its highest. The North American story is that the U.S. economy is growing, recession has been averted, the business cycle is risk-back-on and Canada as a satellite exporter to the U.S. will participate in the new joyful inflation as central banks raise rates to make sure we all stay within the 2% CPI target and not get too hot nor stay too cold. Mr Harper continues to assure that the government will evaporate the deficit by 2015 (government workers are advised to start looking for private sector employment). Aw shucks, all is calm, all is bright in the kingdom of managed inflation so keep buying more stuff because prices are going up; but just a little bit, 2% per year, no big deal. Rates might go up 25 beeps or so, but no big deal. Your employer can hardly wait to get pricing power advantage and more productivity out of you so he can raise your pay packet and not lose you to the head hunters in Alberta. Wait a minute; the "risk" of rising interest rates is not really the BIG risk that central banks of countries, who are autonomous issuers of their own non convertible currency, lose a lot of sleep over lately. It's the "D" word that provokes insomnia in government and the private sector. As Chris Kimble points out in the chart above, the stress at the Fed could not be much lower than it is today and sleep should be effortless. But what if asset valuations decline? Is that not the greater risk over time? Japan: Here is what 30 years of low interest rates looks like; and here is the effect on assets and behaviour. 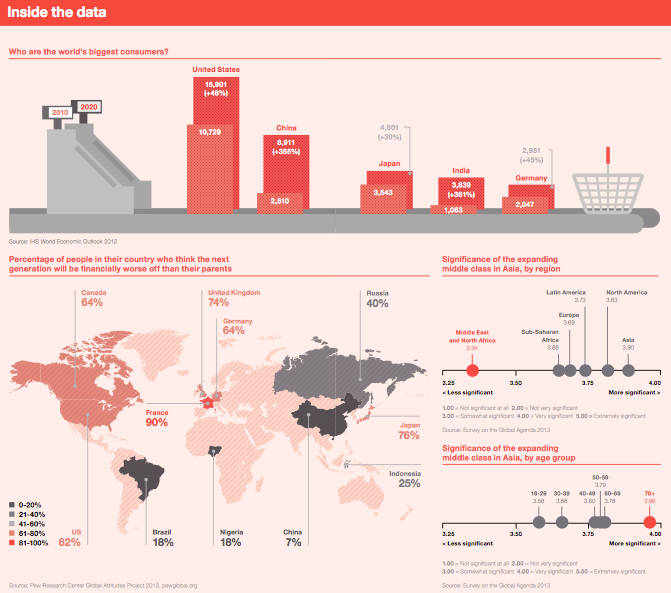 The October 2013 Credit Suisse Global Wealth Databook contains lots of comparitive charts on recent national and global changes in wealth. This one shows the change in household wealth between 2012 and 2013. The authors point out that since 2000, Canadian per capita wealth has been rising at about 3.7% Y/Y after discounting for exchange rates. Relative to the U.S. Canada has a more equal wealth distribution with both a smaller percentage of people with less than US$10,000 and a larger percentage with wealth above US$100,000 and the Canadian wealthy account for 3% of the top 1% of global wealth holders, despite having only 0.5% of the world’s population. So far so good. But look at the inset chart of the Canadian Trade Balance; since the pit of gloom in March 2009 the advances in wealth measures are at the expense of Canadian export production. We are not producing and selling stuff to other nations as our main activity. As Credit Suisse points out; financial assets account for more than half of household wealth and so with fire sale credit available, Canadians have been deriving their wealth by consuming on margin fueled by their cohort bidding up financial asset prices. Indeed this wealth created by consumption is subject to all the agents continuing to agree on rising valuations. There is no room for depreciation in the model. We have the illusion that the world functions thanks to programmed design, university research, and bureaucratic funding, but there is compelling—very compelling—evidence to show that this is an illusion, the illusion I call lecturing birds how to fly. Nassim Taleb "Antifragile: Things That Gain from Disorder"
We have lot's of "Eiffel Tower" price patterns to refer to that have a fully formed right side to the tower; Japan is a classic with a multiple decade reversion. I have lined up the peaks of the Japanese, U.S. and Canadian stock markets with housing index overlays. The Canadian pair looks to be at a crossroad and according to a Statistics Canada medium growth projection, net immigration along with net birth-death may also have a right side reversion.